Terrell Taylor's game winner against Florida made for one of the best NCAA Tournament games played in Chicago. But it's still a distant second to the best tourney game in Chicago. Since Chicago is hosting a few first and second round NCAA Tournament games this year, we thought it’d be fun (and perhaps painful if you’re an Arizona fan) to look back on some of the best NCAA Tournament games played in Chicago. Let’s get things started way back, when dudes wore little shorts and DePaul was rather relevant. Many years ago, when the NCAA blatantly put some tournament teams in their home cities, a very good DePaul team — 28-3 record, finished in the AP top 10, Rod Strickland running the show at point guard — advanced to the Sweet 16 after beating St. Johns in overtime. DePaul would lose to Louisiana State (LSU) in the Sweet 16, and the Blue Demons haven’t made it past the second round since. Fun fact: The song “One Shining Moment” was first used by CBS during the 1987 NCAA Tournament. Outside of Gene Keady’s comb over, it’s the longest running joke in college basketball. In 1993, beating Duke got you on the cover of SI, as well a deal from God that you'd have an extremely long and prosperous NBA career. From 1988 to 1992, Duke made five straight Final Fours, which was when basketball fans began to realize Duke was an extremely hateable team (something ACC fans had realized many years prior). 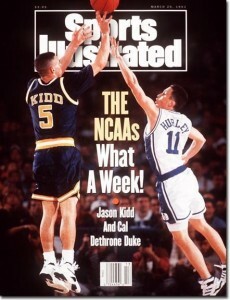 In 1993, in a second round game versus California, the growing masses of Duke haters had their one shining moment. Six-seeded Cal, led by Jason Kidd, beat 3-seeded Duke, led by Bobby Hurley, Grant Hill, and the perpetually suspended-in-disbelief Thomas Hill. While a 6-seed trumping a 3-seed isn’t a major upset, this was treated as one, since Duke was a preppy-clad juggernaut fresh off of two national titles. Jason Kidd would go onto to become the patron saint for Duke Haters (he’s also having a damn good, and never ending, NBA career). Two big things happened here: Creighton netted a first-round upset of Florida, when Terrell Taylor swished a three with 0.2 seconds left in the second overtime to win the game. This led to Creighton being matched up with Illinois in the second round, which led to the Illini winding up in the Sweet 16. The bigger story was the SIU Salukis, an 11-seed coached by Bruce Weber. SIU started its impressive run to the Sweet 16 by upsetting Texas Tech in the first round, and then overcoming a 19-point deficit to beat Georgia in the second round. Bruce Weber soon became a much talked about mid-major coach, and while he would spend one more year at SIU, he’d eventually takeover as head coach of the University of Illinois in 2003. By 2005, Weber once again found himself in Chicago for an NCAA Tournament game, which proved to be the most dramatic tournament game played in the Windy City. If you weren’t a basketball fan living in Chicagoland at the time, you may have forgotten about the 2004-05 Illinois team that featured Dee Brown, Luther Head and Deron Williams. Coming into the tournament Illinois had lost just one game. The Illini easily made it to the Elite 8, where they’d match up against Arizona, a 3-seed who eeked its way into the round of eight by beating Oklahoma State in the final seconds during the Sweet 16. Deron Williams enters "He's on Fire!" mode against Arizona. The frantic final minute of regulation featured Illinois scoring five points in about 20 seconds to tie the game, Arizona scoring zero points and committing two turnovers, and Allstate arena seeing the type of excitement that wasn’t matched until Bieber rocked the B96 Jingle Bash last year. Illinois would win the game by one point in overtime, and advance to the Final Four for the first time since 1989. The Illini would then advance to the championship game, where it’d lose to UNC, but maintain its status as the People’s Champion (and have a very dramatic YouTube video made in its honor). The basketball historian returns! Love it!